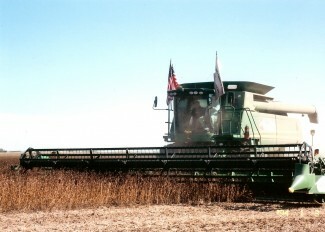 Week of October 24, 2010: Our harvest season officially ended on Monday. Farm Rescue harvested for 10 farm families this year and planted for 20. That brings the total number of families assisted to 131 since field operations began in 2006. 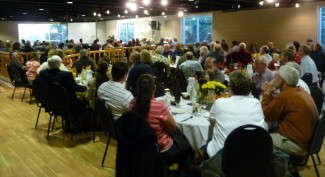 Some of those families spoke at the third annual Farm Rescue banquet, which was held Friday night (October 22) on the campus of Jamestown College. Thank you to our sponsors, volunteers, media, and donors who made such an evening possible through their goodwill. We believe in the generosity of the human heart! Week of October 17, 2010: Our Men in Blue finished harvesting in Argusville last Wednesday night, thanks to the united effort of neighbors and strangers. 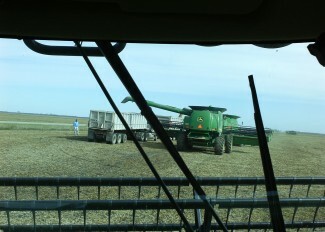 Five combines were rolling in the field at one point, following one behind the other as they harvested the bumper soybean crop (50+ bushels an acre) for a young farm family. Clarence snapped the picture above from inside the combine as he waited to unload his hopper. Week of October 10, 2010: The stars aligned over the weekend for Bill K., Pete and Charlie to get the soybeans harvested in good fashion at Jamestown. They had beautiful sunny weather at their backs, clocking in on Saturday morning (Oct. 9) and finishing early Sunday afternoon. A bit of overtime was in store as they moved the combine and header east toward Fargo for an injured farmer at Argusville. The 37-year-old farmer there suffered a severe head injury and is hospitalized in St. Paul, where he is undergoing coma stimulation therapy. Gene and Charles fired up the 9770S combine this afternoon and will stay the course for a couple of days on the farmer's 700 acres of soybeans. Jeff from Minneapolis will arrive on Tuesday to help, along with Charlie and Clarence on Wednesday. Volunteers with a local seed company, relatives and neighbors will also be helping bring in the crop at Argusville -- the more the merrier! Our hearts go out to this young farm family. A well-deserved rest is in store for our volunteers this week, as we wait for the soybean crop to ripen at Jamestown. The farmer there was in an ATV accident that left him with multiple injuries. Take a hot bubble bath, Boys! The harvest season is winding down. Week of September 26, 2010: Our Men in Blue made tremendous headway in the field, finishing harvest at Westhope, Upham, St. John and Tower City! 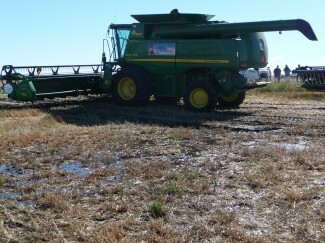 Collectively, they put more than 1,500 acres of wheat and soybeans in the bin and in some cases had to dodge standing water in fields. Families at St. John and Tower City were dealing with the aftermath of unfortunate accidents. A fall from scaffolding almost took the farmer's life at St. John, causing gangrene and damage to his colon when he broke his fall by straddling a pipe. A tractor explosion left the farmer at Tower City with second and third degree burns on 20% of his body, and subsequent skin grafting at a burn center in St. Paul. We are thankful that both farmers are rebounding from their accidents! And thankful, too, for the addition of Jay and Kim... two new volunteers from Bismarck and Wishek that joined our ranks this week. Week of September 19, 2010: Shhh. Don't tell Mother Nature that Farm Rescue volunteers are harvesting in Westhope and Upham at this very moment... she'll send rain otherwise. In the immortal words of Sergeant Schultz from Hogan's Heroes, "I see nothing!" 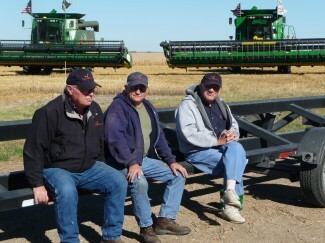 Week of September 12, 2010: Charlie, Warren & Pete made headway on the canola crop at Bowbells. In 20 days, volunteers have harvested just 600 acres there due to constant rain and wet soil conditions. It has been the same story at Steele. Same rain. Different locale. Bill K. was able to fire up the combine though on Tuesday afternoon, but Mother Nature has definitely gotten the best of us this harvest season. On Wednesday, our wonderful Men in Blue moved combines and headers to farms at Westhope and Upham. The family at Upham is dealing with lung cancer and was recently in a serious car accident. Prayers of healing are appreciated for this family. Week of September 5, 2010: Louie and Al finished harvesting wheat at Solen today (Sunday), while Bill and Clarence started in on a flax crop at Steele. The farmer there suffered a broken pelvis in a four-wheeler accident. 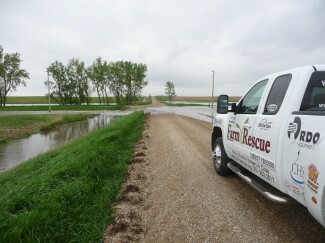 After they shut the combine off at 7 p.m., Farm Rescue's nemesis arrived - RAIN. The unwanted guest has no intention of leaving anytime soon. Bill W., Louie, Al and Pete will move equipment north on Thursday to prepare for harvest at Westhope for a farmer who is recovering from a heart attack. Think sunshine! 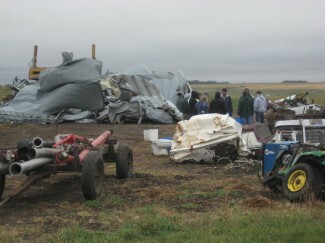 Week of August 29, 2010: Volunteers from SunPrairie Grain, Walmart, and Ryan Chevrolet arrived in force at Bowbells to help with tornado clean-up efforts. A damp day kept Farm Rescue volunteers out of the field, but not from the labor-intensive work of picking up debris in nearby fields. Continental Metal of Minot brought equipment to compact the remains of outbuildings and 21 grain bins for recycling, while U.S. Senator Kent Conrad offered words of encouragement. Bill W. and Richard arrived from Pennsylvania on Sunday to help harvest, but the combine sat idle for most of the week due to rain. Elsewhere in the state, Louie and Bill K. managed to get some harvesting done south of Mandan near Solen for a farmer that suffered a stroke. A big thank you to the employees and staff at SunPrairie Grain, Walmart and Ryan Chevrolet for all their hard work on Monday. We're proud to call you sponsors of Farm Rescue! 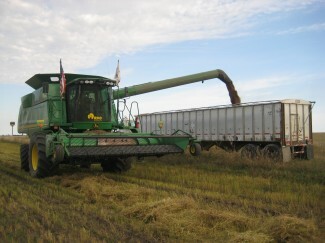 Week of August 22, 2010: The 2010 harvest season officially began for Farm Rescue on Wednesday at Cando, ND. 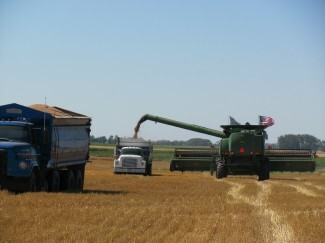 Gene, Charles and Andy (a new volunteer from Oregon) harvested wheat for a family battling brain cancer. By Friday, the Fabulous Trio moved equipment to Bowbells to begin harvest for a farmer who survived a deadly tornado just two weeks earlier. The massive twister destroyed outbuildings, farm machinery, vehicles, and the farmer's house from which he walked out of the basement alive. 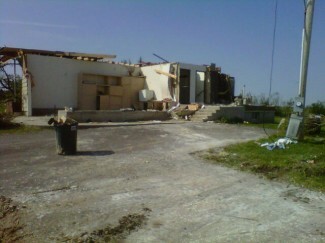 The tornado produced winds of up to 165 mph. Week of June 6, 2010: Spring planting officially ended on Tuesday with the return of equipment to RDO Equipment Co. dealerships in Washburn and Aberdeen. Thank you Charles, Bill K., Warren, Gene and Louie for seeing us through the final days of the season! 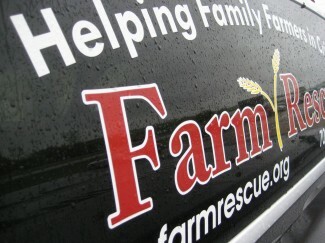 Farm Rescue assisted 20 farm families this spring. We ended the week with a roar at a benefit ride for Farm Rescue that was hosted by Stutsman Harley-Davidson in Jamestown. Lots of leather and shiny bikes! Remember to pick up a route stamp card at Stutsman Harley-Davidson and play Rolling with Farm Rescue. You could be the lucky winner of a brand new Harley-Davidson motorcycle! Contest cards are also available by clicking on "Rolling with Farm Rescue" under our "News & Events" heading. Good luck! Week of May 30, 2010: Our North Dakota volunteers continue to keep the seeders rolling in between rain showers! Charles and Clarence finished planting soybeans at Gackle early in the week and then moved equipment to Monango. Farm Rescue is planting soybeans there for a family dealing with rehabilitation. Bill K. arrived on Thursday to relieve Charles, and he and Clarence planted through Friday until rain halted operations. Louie, Warren and Gene kept chipping away at the acreage in McClusky and finished planting 960 acres of wheat by week's end. Friday also brought the departure of our founder, Bill Gross, who left North Dakota to return to his "day job" as a pilot for UPS Airlines. Operations are quickly winding down for the season. Thanks, Men in Blue! Week of May 23, 2010: The Limke family left on Sunday for their home in Kentucky, but not before Jack planted most of the crop for a Berthold area farmer with a severely fractured leg... a farmer who just happened to be Jack's former high school principal. Small world, isn't it? To say it has been a wet week in the northern part of North Dakota would be an understatement. Operations were suspended Tuesday thru Thursday due to torrential rains and overland flooding in some areas. But the rain gave our volunteers a much needed rest and time to welcome a new volunteer into our ranks - Jeff from Minneapolis. 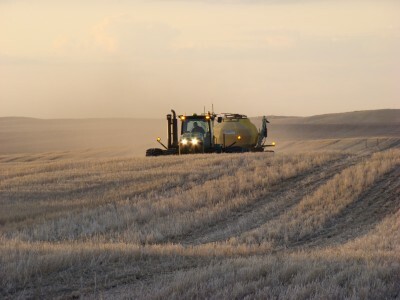 He and Charles finished seeding 50 acres at Berthold on Wednesday, and then moved equipment to Gackle the following day. They are planting soybeans for a farmer who is recuperating from double knee replacement surgery. When the weather permits, our Men in Blue will be planting at McClusky for a farmer who is recovering from surgery to repair his bicep, which he injured while working cattle. Keep it up, guys, spring's work is almost complete! Week of May 16, 2010: Our volunteers put in an incredibly busy week, working through the night to get crops in the ground for families at Finley, Fortuna, Burlington, Kramer, Newburg, Esmond, and Dagmar, MT. Thousands and thousands of acres in a week's time. It is beyond fantastic! The Kentucky-Wisconsin volunteer duo of Jack and Dave planted close to 2,000 acres collectively at Fortuna and Dagmar, thanks to their extended stay in North Dakota. Our hearts go out to the Dagmar family, as they deal with paralysis from a stroke and the death of their son just days before our volunteers arrived. Louie, Charles, Jerry and Steve (a new volunteer from Vero Beach, FL) spent days in the field and corrals at Burlington, planting crops and helping two brothers with health challenges. One brother is recovering from a broken leg that occurred when he was gored by a bull while on horseback; the other brother is battling complications from esophageal surgery. Randy, our pilot from KY, jump seated into Minot on Sunday to lend a helping hand once again. He, Bill Gross and Bruce planted 600 acres in less than 23 hours for a farmer at Kramer who is recovering from triple bypass heart surgery. Throw Clarence, Bill K., Warren and Steve B. into the mix for the week and the result is assistance for three more farm families that are dealing with leukemia, colon cancer and emergency surgery. Whew! Quite a week. A BIG THANK YOU to all our volunteers! "I had this man call me from all over the world." "The most that they can do is done without question." "It was touching emotionally to see that kind of help come." "I couldn't have done better myself." "I consider those volunteers to be angels among us." "They're going through a real rough time right now." Week of May 9, 2010: Rain, rain and more rain has kept planting to a minimum this week. But it hasn't kept volunteers at bay. The Limke family arrived on Tuesday from Kentucky along with a new volunteer, Bruce, from Interlaken, NY. 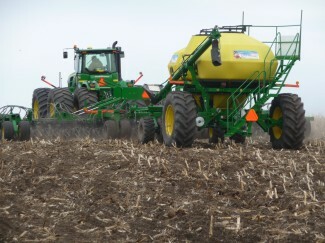 On Wednesday, fields became dry enough at Luverne to plant soybeans with the help of volunteers from RDO Equipment Co. The Men in Green know how to operate green machines! We appreciate the help in the field and terrific coverage from the media. Out West, Louie found a way to keep the planter moving on Tuesday at Halliday. By Wednesday night, Charlie and Jack had the wheat crop in the ground. And today (Thursday), Dave and Jack are moving the drill north, almost to the Canadian border, to the town of Fortuna, where they will be planting for a farmer who broke his neck in a car accident. Week of May 2, 2010: A man can get mud on his boots, his pants, and his face when he is farming. Farm Rescue Founder Bill Gross (pictured) did just that on Thursday as he and Dave power washed the planter. Not many founders actually get dirt under their fingernails. You are one-of-a-kind, Bill! Earlier in the week, the Weavers (two brothers and a son) from Pennsylvania and Kentucky arrived in North Dakota to volunteer, along with a gentle giant from Wisconsin (the aforementioned Dave). They are salt of the earth. The Weavers tore out of the Farm Rescue office on Monday with our field trailer and zipped to Zap. After a quick pit stop to see North Dakota's famous gal (Salem Sue), they planted oats through the night for a farmer suffering from multiple health problems. The next day, the Weavers moved equipment to Halliday to help a farmer with a muscle disorder which is affecting his eyesight. Unfortunately, it began to rain on Tuesday and didn't let up all week. The Weavers returned home on Saturday. Week of April 25, 2010: Farm Rescue volunteers were very busy this week. Louie, our techno wizard, started the week in Fredonia with Clarence and Ray, then hopscotched up to Aneta and back down to Lehr before week's end. We need to get him a frequent flier card! While at Lehr, Louie and Steve planted wheat for a farm couple facing pancreatic cancer. 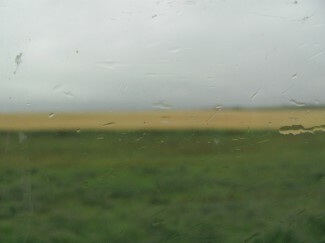 To the north at Aneta, Bill K. and Charles planted 800 acres of wheat in three days for a farmer with a brain tumor. They were in the field early in the morning on Day 3 and finished at 9 p.m., beating hurricane force winds and rain. Farm Rescue's new transport trailer was put to use on Thursday for the first time as equipment was moved from Lehr to Zap, thanks to the efforts of Walter, Tyler, Tom and Clarence. Oh and Jack, thanks for donning the welding helmet for a week straight...the weight box you made for the semi worked perfectly! 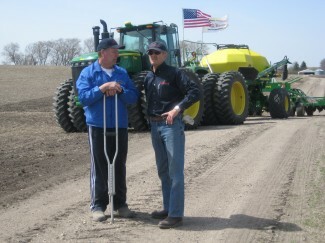 Week of April 18, 2010: Our Men in Blue kicked off planting operations in North Dakota on Monday, planting wheat at Luverne for a farmer with a severe knee injury. After two days in the field, Gene and Bill K. moved equipment to Niagara, where they planted wheat and barley for a farmer who lost part of his hand in a grain auger accident. Two days later (is there a pattern developing here? ), Gene and Bill moved equipment to Aneta. They took a much needed break over the weekend! Our second crew of volunteers began the week planting at Fredonia for a farmer who is battling stomach cancer. Some setbacks and rain delays have slowed progress, but hopes are high for the crop to be in the ground by early next week. "There's a great need for this [organization]." Week of April 11, 2010: We are back in the fields again! The 2010 planting season got underway this week when Charles and Jerry moved equipment from RDO Equipment Co. in Aberdeen, SD, to our first case at Rockham, SD. 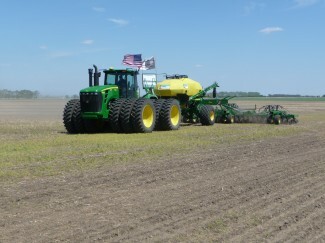 They planted wheat on Thursday and Friday for a farm family that is dealing with brain cancer. On Saturday, equipment was moved to Leola, SD, where Charles and Clarence worked on planting wheat for a farmer who is recovering from back surgery. 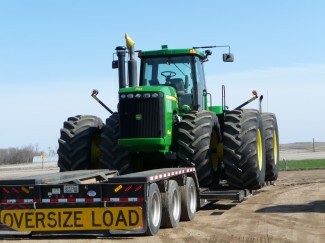 Meanwhile back in North Dakota, Gene and Bill K. moved equipment from RDO Equipment Co. in Washburn, ND, to Luverne, ND. Next week Monday, volunteers will be planting wheat for a farmer who severely injured the muscles and tendons in his leg and now is in an immobile leg brace. Farm Rescue thanks RDO Equipment Co. for their tremendous support this spring, once again providing our organization with top-notch ag equipment! "Something like this for a family farm is amazing."